SLOVIANSK, June 06. /ITAR-TASS/. Practically the entire town of Sloviansk in Ukraine’s southeastern Donetsk region has been left without electricity after a massive air strike staged by the Ukrainian army, a spokeswoman for the people’s mayor of Sloviansk told ITAR-TASS on Friday. “There is no electricity in the majority of districts,” she said, adding that Internet connection had been lost practically all around the town too. According to the spokeswoman, water supplies had not yet been resumed in the majority of districts. 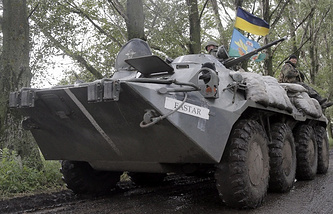 Massive air strikes and artillery shelling by the Ukrainian army on June 3-4 damaged the town’s central water supply system and water supplies to Sloviansk, Kramatorsk and a number of nearby villages were interrupted. By now, water supplies have been resumed to a number of populated localities. The humanitarian situation in the city keeps deteriorating, she said, and pensioners are treated to rations near the building of the municipal council. She also said the situation is also grave with medicines in the city as there was an extreme shortage of antibiotics, painkillers and bandaging materials. Residents of Ukraine’s south-eastern territories, mainly the Donetsk and Luhansk regions, staged massive protests against the coup-imposed Ukrainian authorities. Their urge to defend their rights was apparently prompted by Crimea’s accession to Russia in mid-March. Demonstrators in the south-east, who have been demanding Ukraine’s federalization, seized several government buildings. A military operation, conducted by Kiev against federalization supporters in Ukraine's south-east territories, has already claimed dozens of lives, including civilians. The Donetsk and Luhansk regions held referendums on May 11, in which most voters supported independence from Ukraine. Russian President Vladimir Putin has repeatedly dismissed Western claims that Russia could in any way be involved in protests in Ukraine's south-east. Russia has been insistently urging Kiev to stop the military operation, which involves armored vehicles, heavy artillery and attack aviation, and engage in dialogue with the south-east.